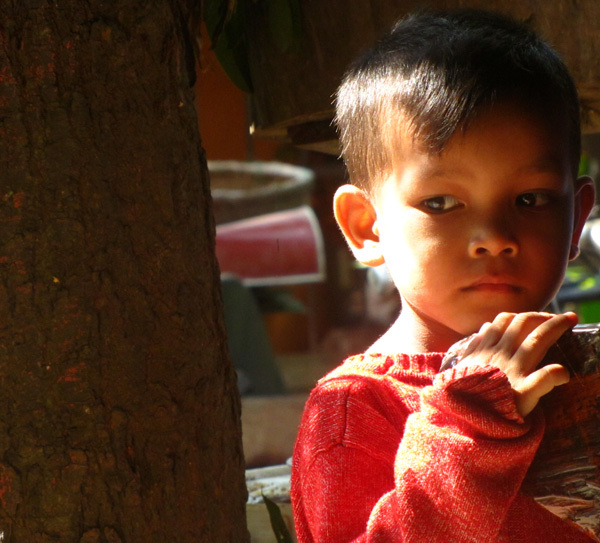 Tuesday, February 16th, was spent riding around in a tuk-tuk visiting all kinds of villages and wonderful charity centers around Battambang. First we went to the Phare Ponleu Selpak NGO which takes in children and teaches them music, painting, computer animation, and circus performance. 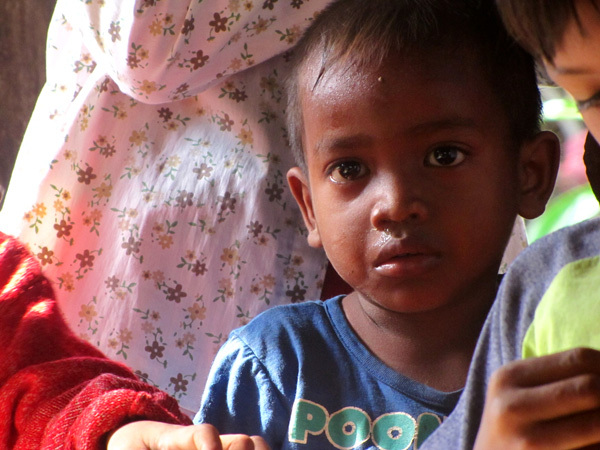 Some of the kids are housed, clothed, and fed there, and many others just come during the day. There are kids of all ages, from those who can just barely walk, to adults around age 22. 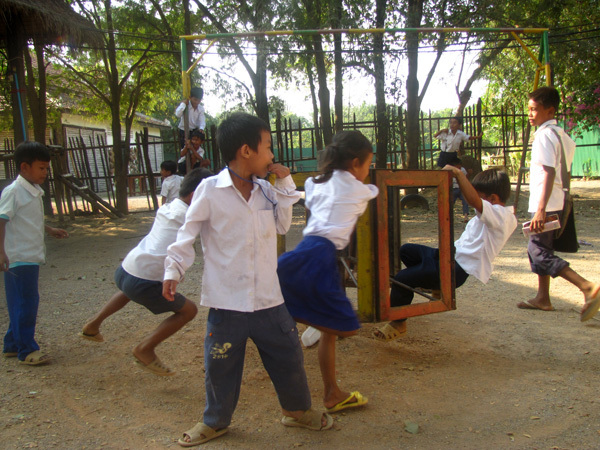 It’s an excellent NGO, one of the best in Cambodia, and they are doing great work. 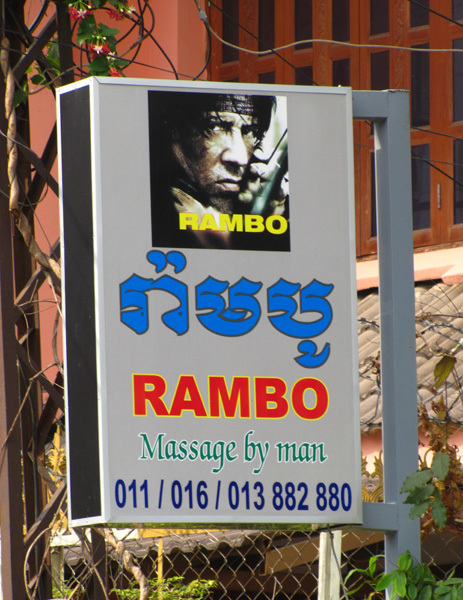 Definitely don’t miss a visit if you’re ever in Battambang. 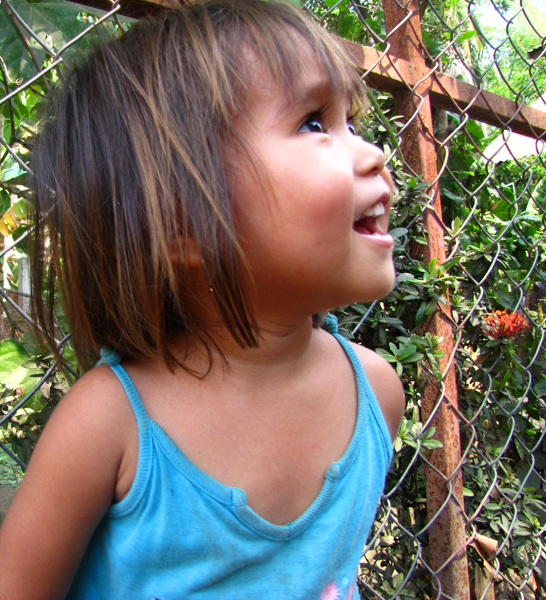 Then we had a short stop at an orphanage where we met some cute kids. 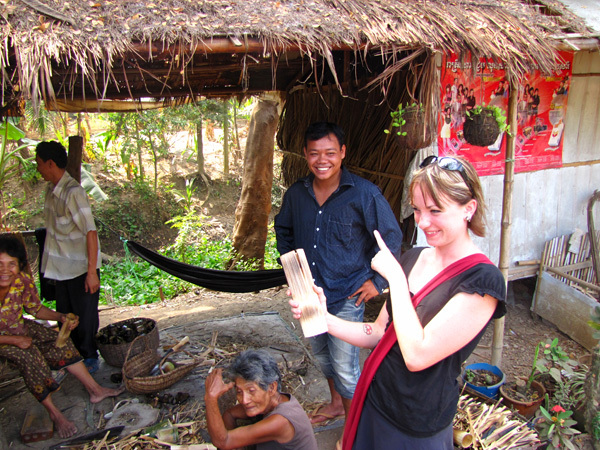 Next we went to a village where bamboo sticky rice is made. I bought some, and as you can see below one of the tuk-tuk drivers wanted to steal it from me. 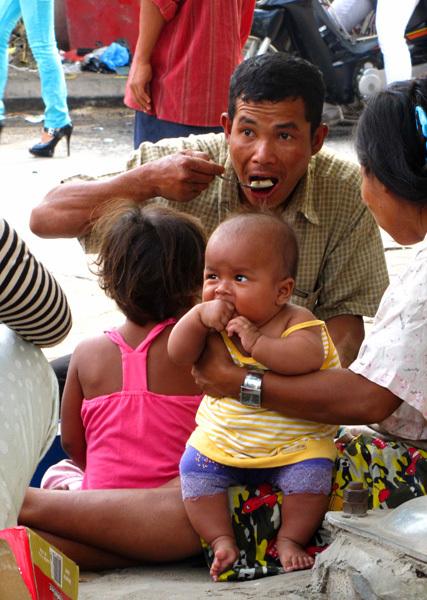 Hey pal, back off my sticky rice! 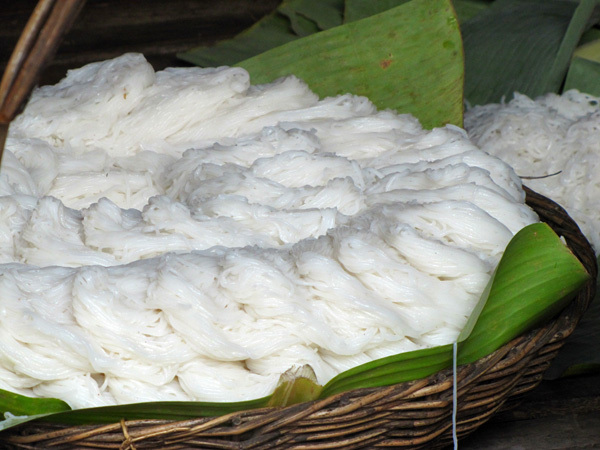 After that we went to a village where they make rice noodles. 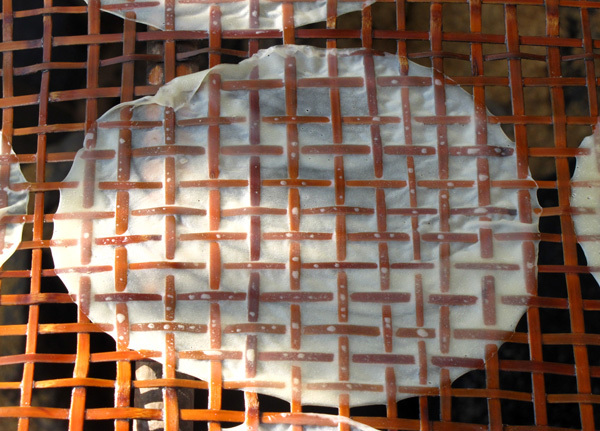 After being cooked the rice is made into a gooey paste. 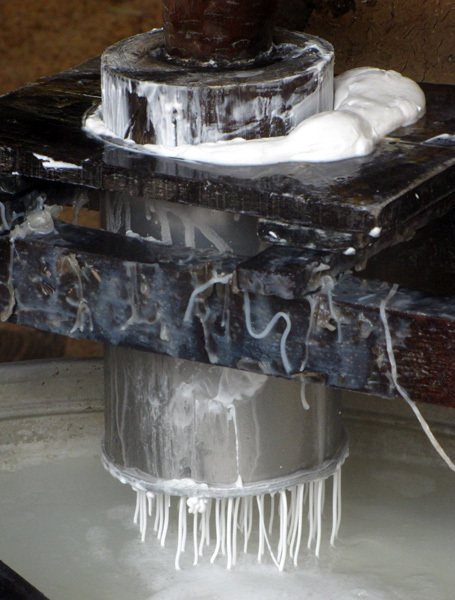 Then the paste is pressed through little holes into boiling hot water. The noodles are then rinsed in cool water and the noodles are ready to be sold. 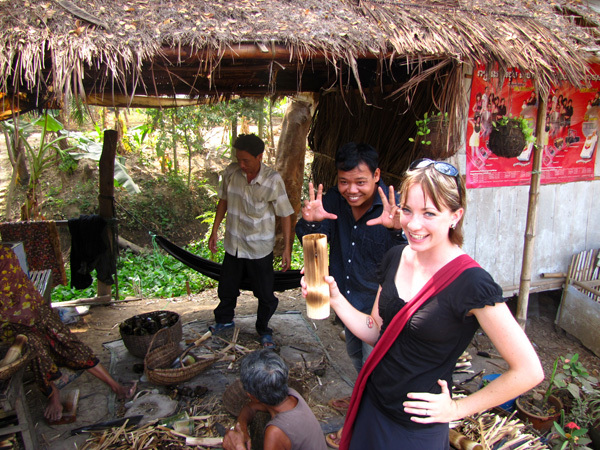 We also visited a rice paper making village. Below you can see some drying on a rack. While there I made a little friend. 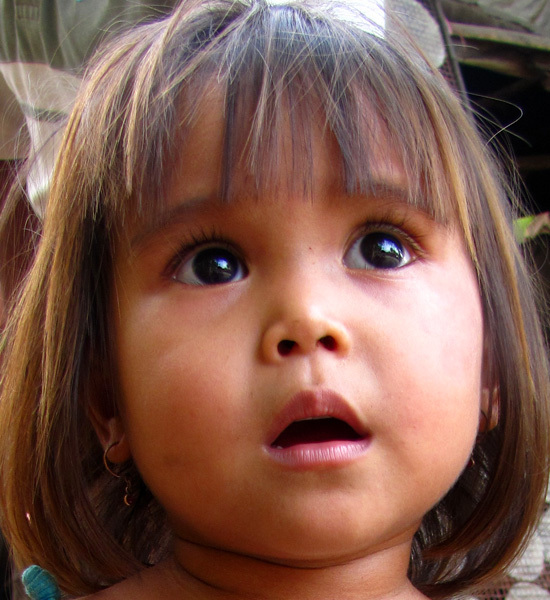 She looked worried until she saw herself on the camera screen, then she was all smiles. 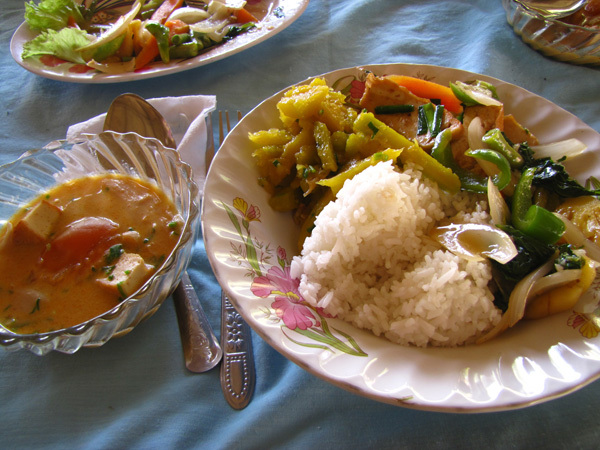 We stopped at the Ptea Teuk Dong Street Family Center for a delicious lunch ($4). 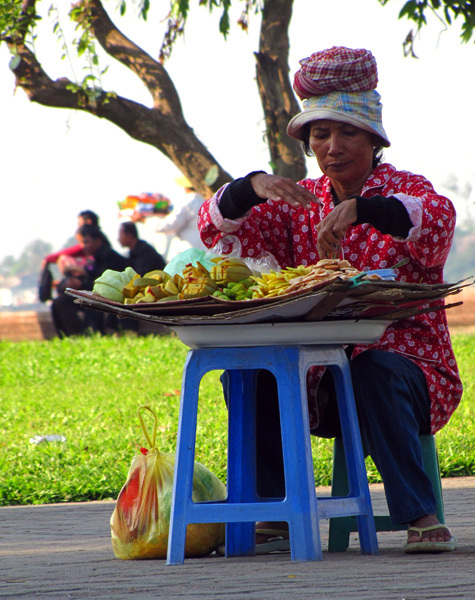 PTD takes in street families and abused women and teaches them vocational skills for 1 year including sewing, weaving, furniture making, food preparation, and agriculture. After a family completes the program they are given a plot of land with a small wooden house and start-up funds for a small business. Besides buying lunch I bought a super cute handmade purse for $5. I had been feeling really dizzy all morning so mom and I ditched the rest of the tour and chilled out in the hotel for the afternoon. 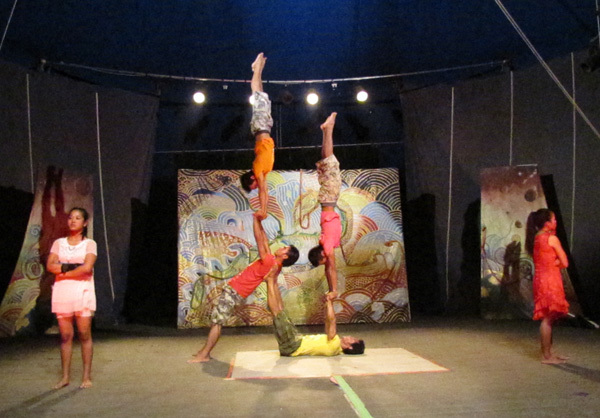 At 6:30pm we went back to the Phare Ponleu Selpak NGO for an hour long circus performance ($8). It was lots of fun. 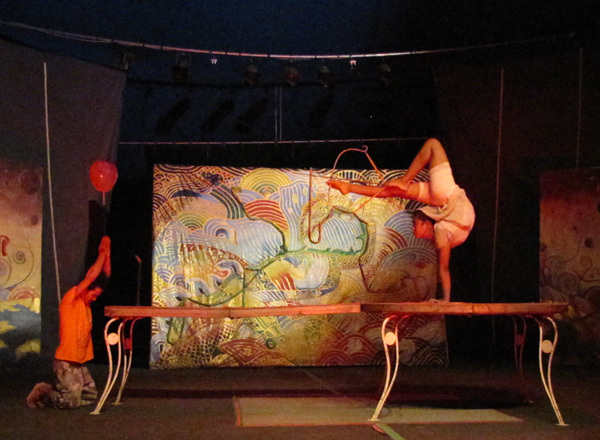 There are no animals, just people doing acrobatics and juggling. There were stories being acted out so I guess you could say it was like a play on uppers. 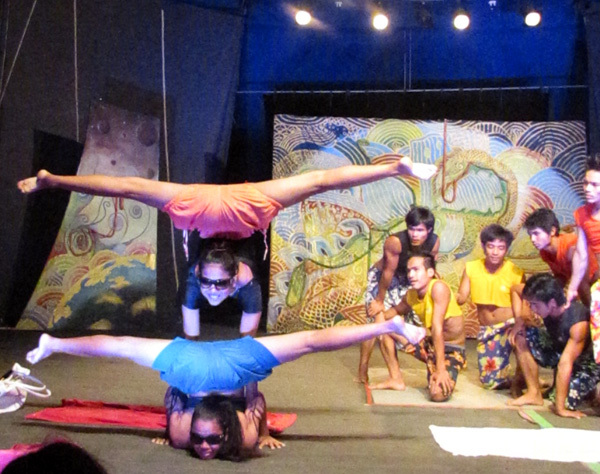 The performers were very talented; the pictures don’t do them justice. Afterward we had dinner at the restaurant there. It was very good, except for the questionable squid things that looked exactly like squid, with eyes and everything, but the chefs insisted was imitation squid… I skipped that dish. 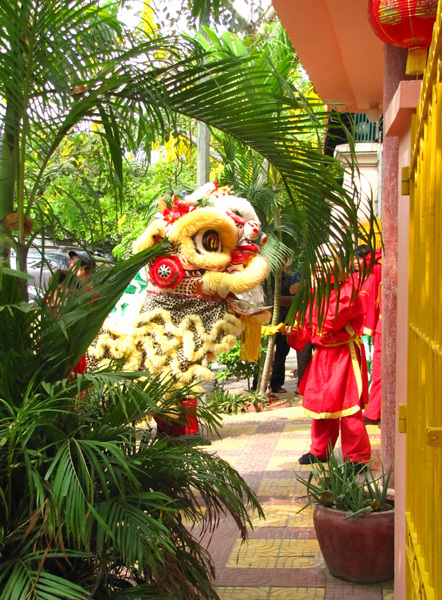 Sunday, February 14th, was Valentine’s day and the start of the Chinese New Year. 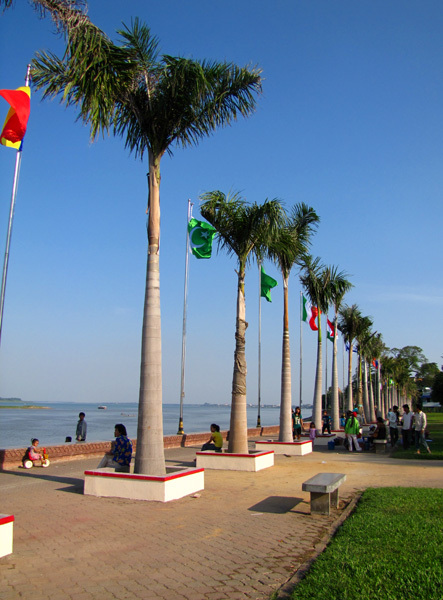 On this day we went on an hour long cyclo tour of the city in the morning during which we stopped at the waterfront, a place I can’t remember the name of with a photo of the current king, and Wat Phnom, the city’s namesake. 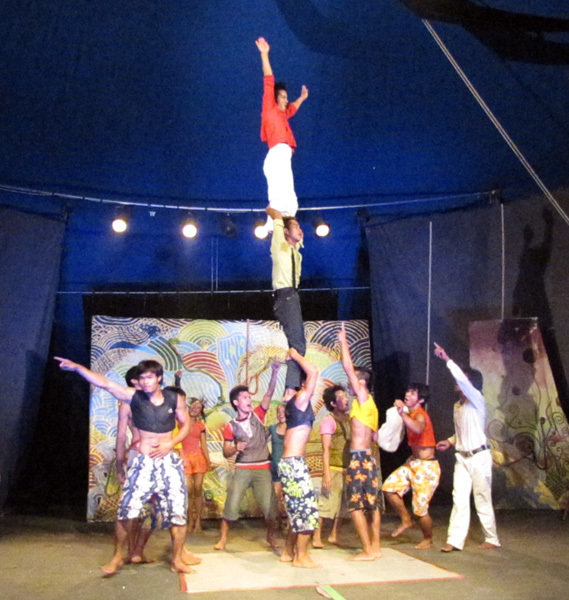 We also saw monkeys climbing along electric wires and children getting rides on an elephant in the park. The tour cost $3, plus a $1 tip, and the proceeds went to the Cyclo Center, a company that works to increase the income of the few cyclo drivers left in the city by providing them with weekly English classes and help for them and their families. Mom and I grabbed a snack of pear and coconut ice cream ($2.80), new flipflops for me ($2.50) and vegetarian pizza ($3.40 for a small and very yummy pizza) for lunch at a nearby bakery before we met with our Intrepid group at 1:30pm for the misery tour. I have to warn you, the following isn’t really for the faint of heart, but I think you should read on because it is important to know the dark history of this beautiful country. 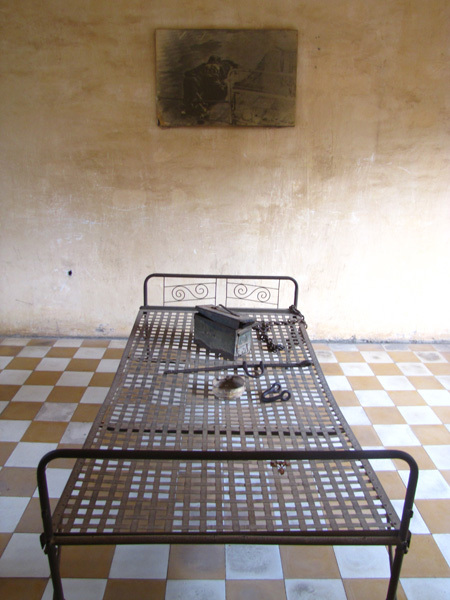 First we went to the Tuol Sleng, or S-21, Genocide Museum. 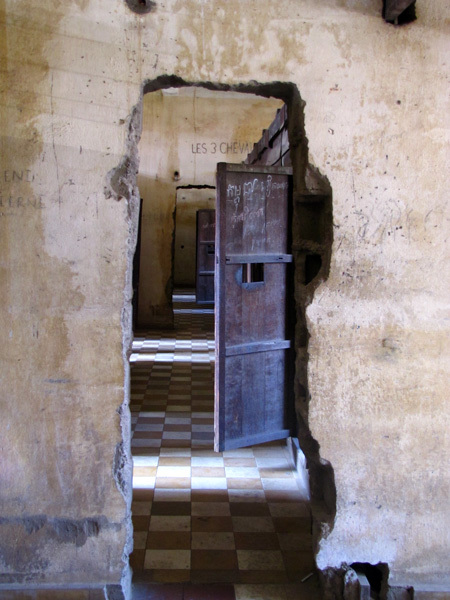 Tuol Sleng was once a school, but it was turned into a prison by Pol Pot’s orders in 1975. 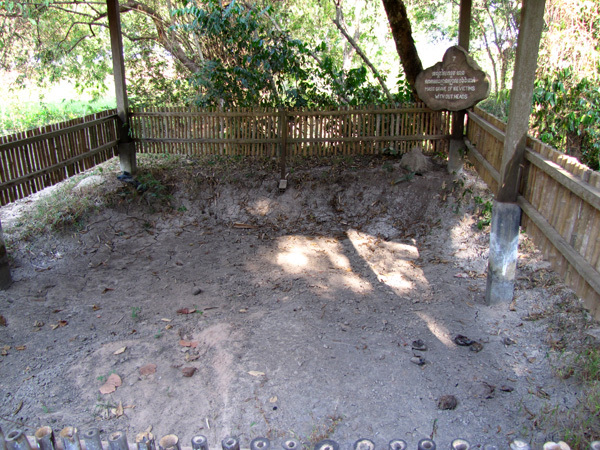 By 1978 the prison had seen 5,765 prisoners (this number doesn’t include the children of the prisoners, estimated at around 20,000), all but 21 of whom were eventually killed in the Killing Fields. 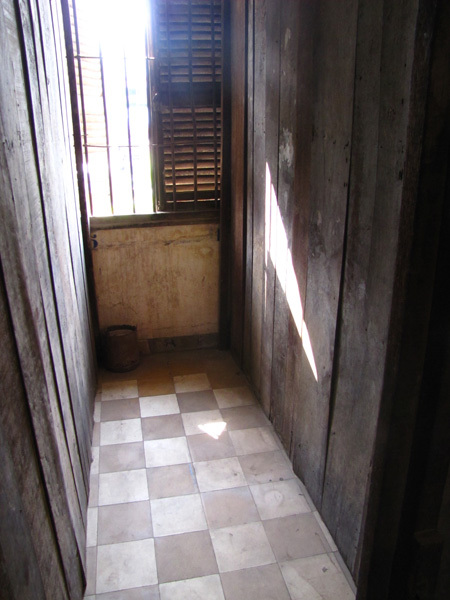 Of the last 21, 14 were brutally murdered in the prison before the S-21 personnel were forced to flee, and 7 managed to hide themselves in toilets and under steps to narrowly escape death. The bodies of the 14 were left by the S-21 personnel and discovered by the liberators later in a nasty state of decomposition. They were the last people to be tortured and killed at Tuol Sleng, and they are buried in 14 graves out front to honor this. 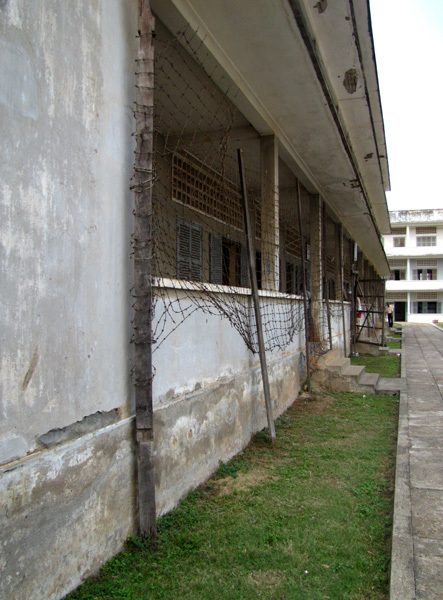 Tuol Sleng is made up of 4 buildings: A, B, C, and D. The first floor of building A was converted into a set of small rooms with glass windows to keep the screams in. 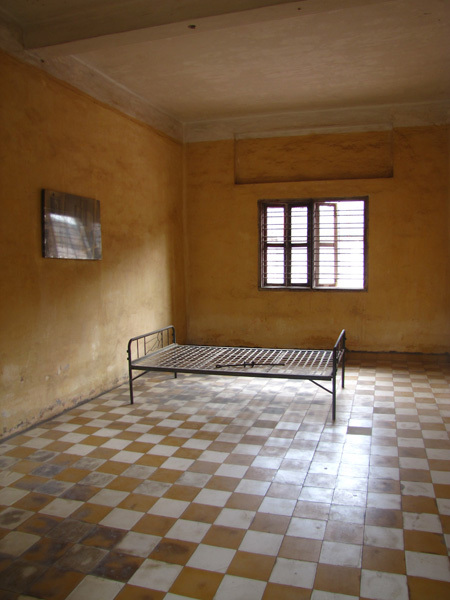 The rooms were used by the Khmer Rouge to torture and interrogate prisoners to make them confess crimes they may or may not have committed, and also give intelligence to the Pol Pot regime. 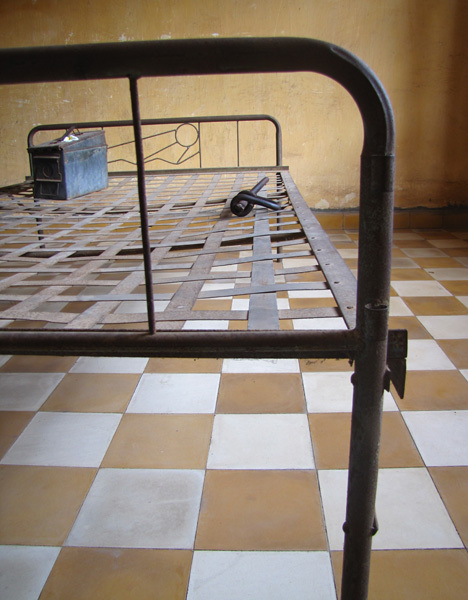 The rooms had metal beds and leg shackles where the prisoners were forced to stay when not being tortured. Sometimes the prisoners were taken outside to a pole to be tortured and interrogated. The prisoner would have his hands tied behind his back and then tied to a rope which was slung over the tall horizontal pole. The prisoner would be hoisted up by his tied hands repeatedly until he lost consciousness, then taken down and dunked head first into filthy water to shock him back awake. The torture and interrogation would start again as soon as the prisoner was conscious. Buildings B, C, and D were used to house prisoners. 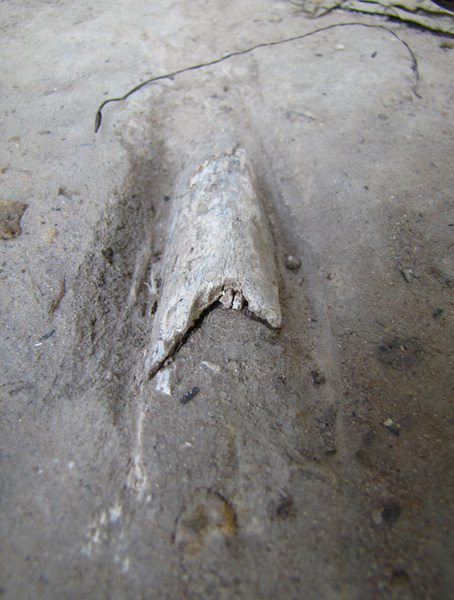 Some floors had cells made of brick, some had smaller cells made of wood, and some had larger rooms where many prisoners were held together, all wearing leg shackles. The prisoners were only allowed to “shower” once every two weeks. A shower was really just a guard coming in with a fire hose and spraying down the prisoner and his cell. 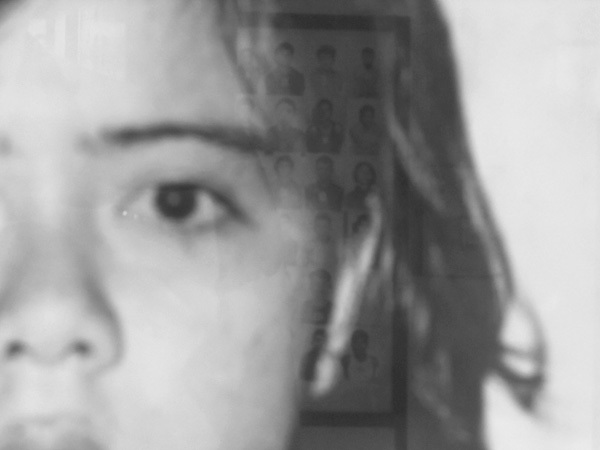 The women prisoners were allowed to “shower” every 2 weeks as well, but only after being raped first. Prisoners flung themselves from the higher floors to commit suicide, but soon a fishnet pattern of barbed wire was installed on every floor to put a stop to that. 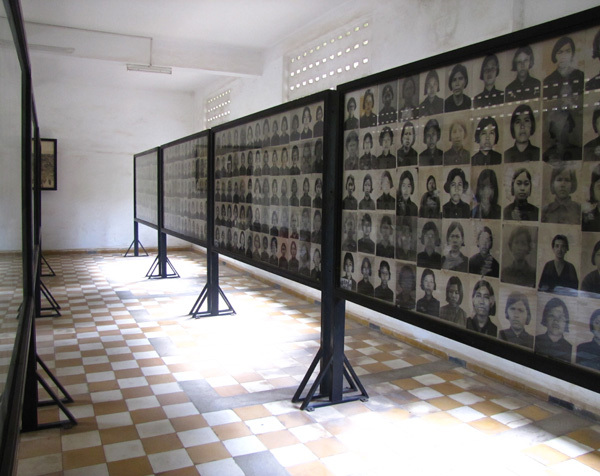 Today, the photos that were taken of the prisoners when they got to Tuol Sleng are on display inside some of the rooms. 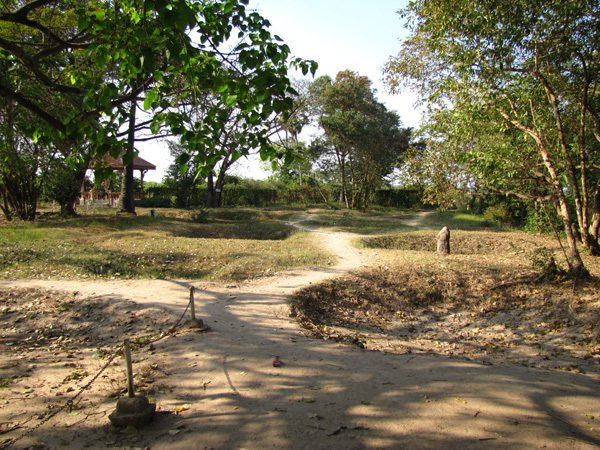 Most of the prisoners were taken to the nearby Killing Fields where they were executed and buried in mass graves. The men were bound, blindfolded, and forced onto their knees before being beaten to death with a metal bar and pushed into the graves. 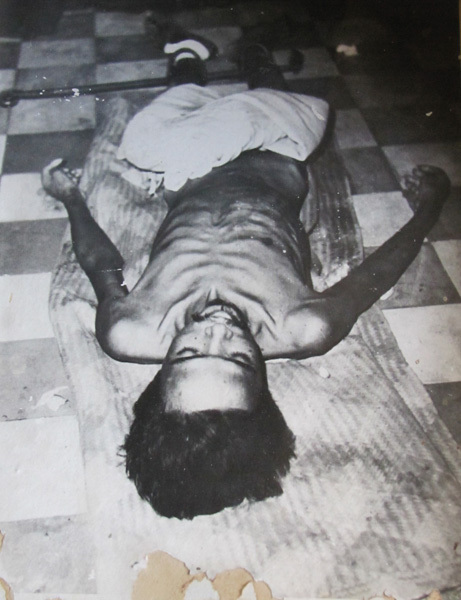 Many were not dead after the beating and ended up buried alive. The women were always raped before being murdered. To kill a baby a soldier would grab her by the legs and swing her like a bat into a tree to crush her skull. Soldiers poured lyme into the graves to suppress the smell before bringing in new victims. 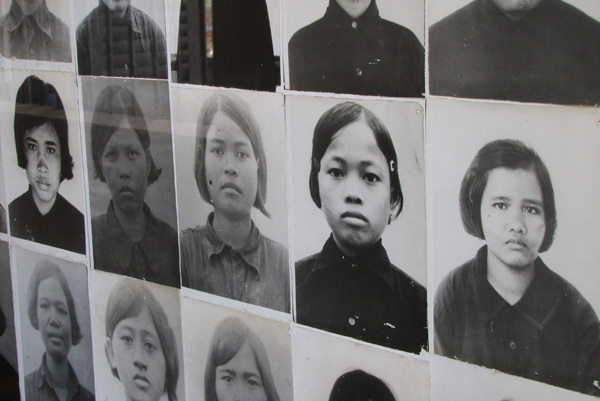 Truckloads of victims were brought to the Killing Fields every 2 weeks to be executed. 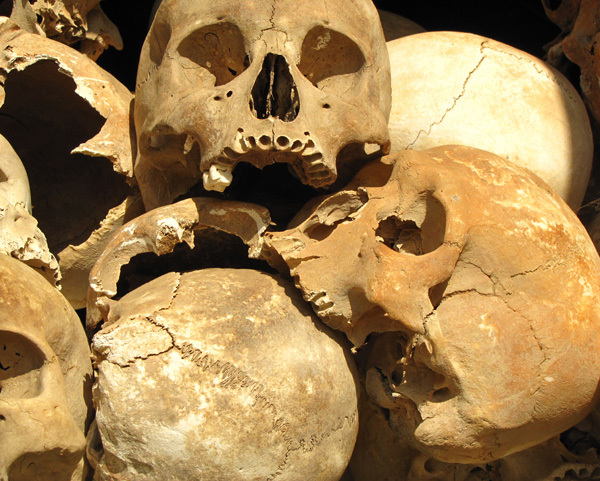 Some of the mass graves have been excavated and the skulls of the victims put on display. 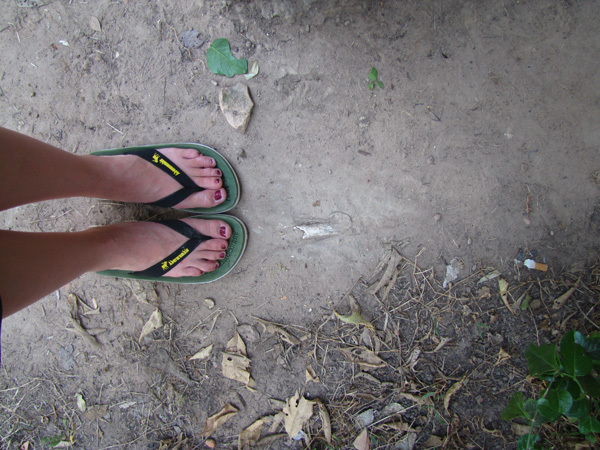 But everywhere you walk in the Killing Fields you are stepping on and over pieces of bone and teeth. The rain washes the dirt away and exposes more all the time. 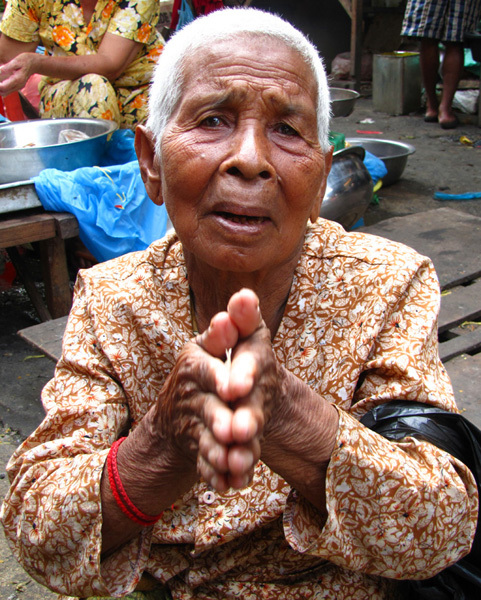 Everyone that lives in Cambodia today has been affected by the massacre in some way. The guide that took us on the tour lost 5 siblings and his father. He was 6 years old when the terror started. 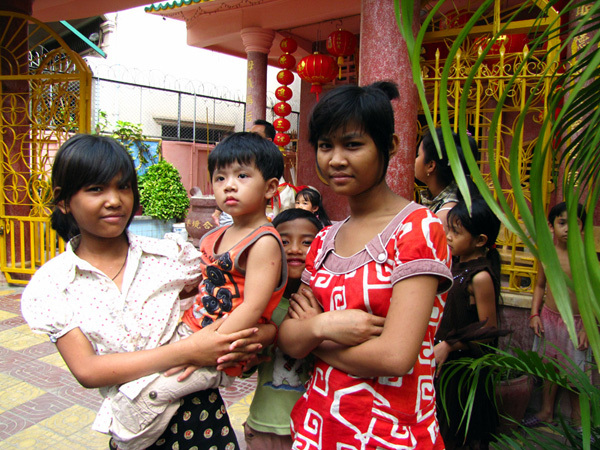 Over 50% of Phnom Penh’s population of 2,000,000 is under the age of 18 because so many of the people who would be older now were murdered. 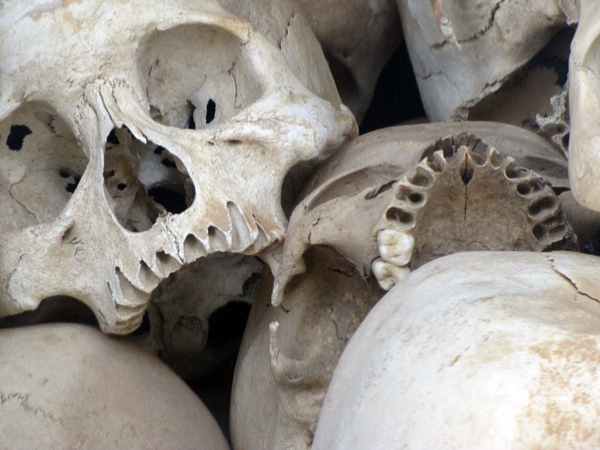 More than 1,700,000 people were killed under Pol Pot, and over 1,000,000 more died of disease or went missing, bringing the total lives lost to about 3,000,000. 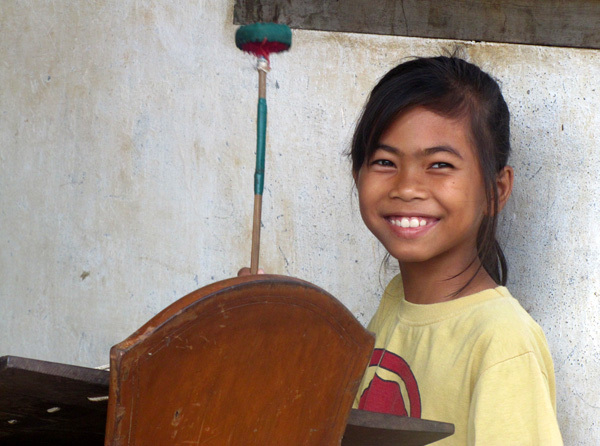 Now Cambodia is no longer a war torn country, but its problems are not over. 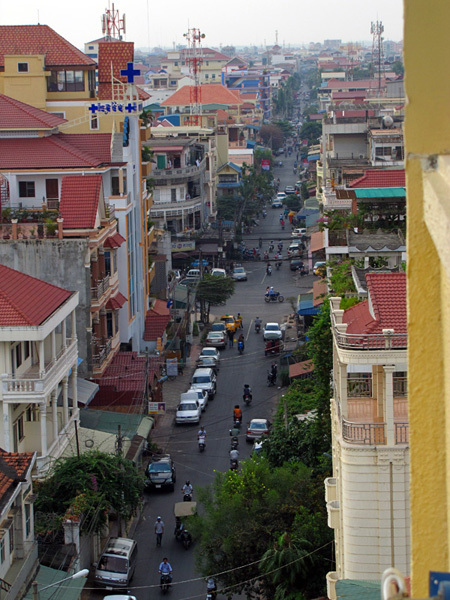 Cambodia’s government is one of the most corrupt in the world, and the corruption is rampant on every level. Even children and their families must pay their teachers bribes or they will not pass their classes, no matter how smart they are. Degrees aren’t worth the paper they’re written on; money can buy any degree you want. 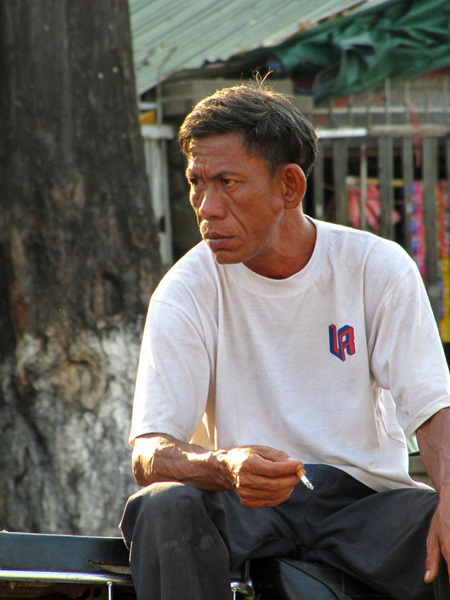 Former leaders of the Khmer Rouge are now government officials. They make a lot of money being corrupt and you see them driving around town in brand new Lexus cars. Corruption is so deeply ingrained that there is little hope for change. Every child wants to grow up to be a policeman or a doctor because they see that this will make them rich from bribes. Money lets you escape justice as well. 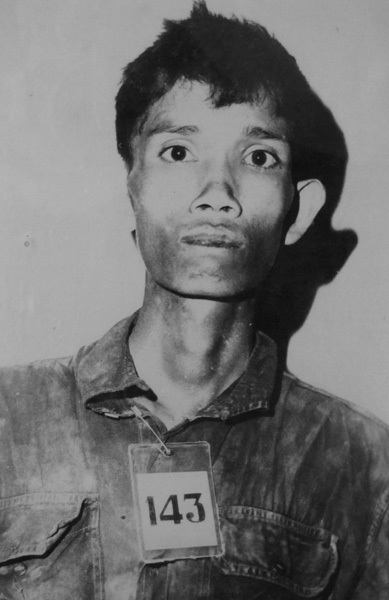 For many years, some of the highest officials of the Khmer Rouge lived in total freedom, but some have recently been arrested and are now being held awaiting trial for war crimes and crimes against humanity. 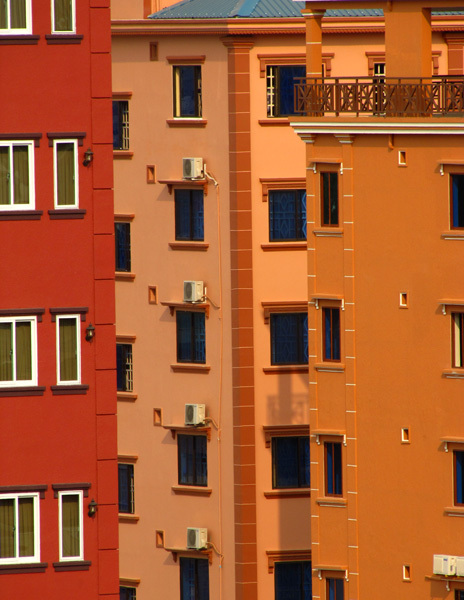 Even so, these criminals live better in jail than 80% of Cambodia’s population lives free. They have nice clothes, huge cells, good food, television, radios, internet, etc. 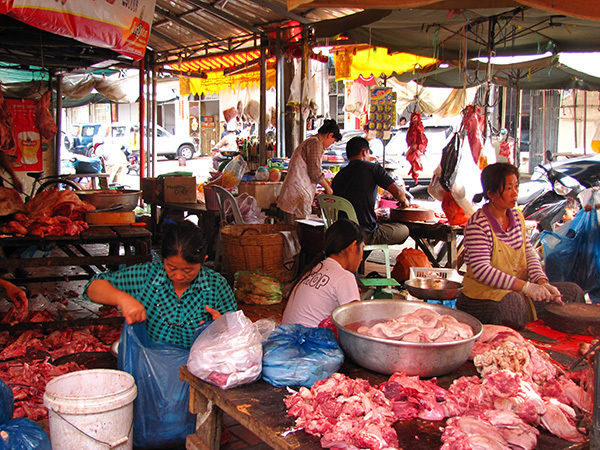 80% of Cambodia’s people have none of these things. It is absolutely mind blowing to experience the incredible good will and happy nature of the Cambodian people after all they have been through. I have never heard of a more resilient people, and you see examples of it here daily. I am amazed. 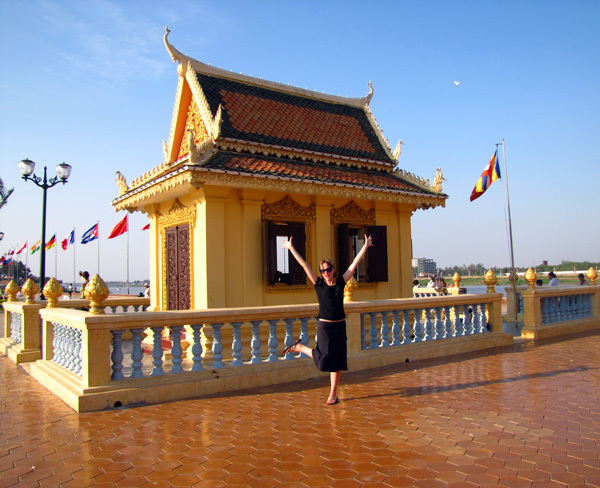 I just booked a trip to Cambodia for my mom and I in February 2010! I am so excited. We’re going on a 15 day tour of the country with Intrepid Travel. After that my mom is heading home and I am staying there to see where my feet take me. 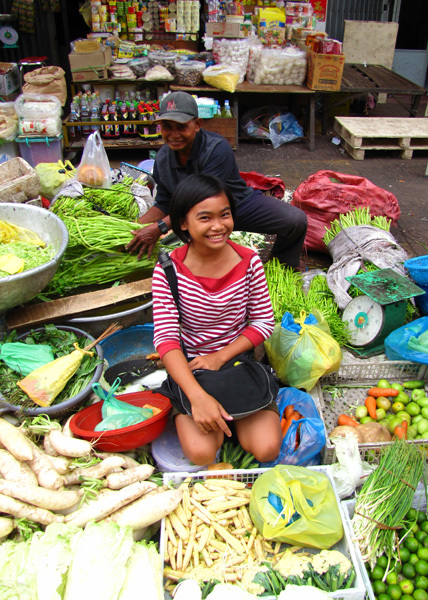 I hope to visit Vietnam, Laos, Thailand, Malaysian Borneo, and possibly Brunei and back to Indonesia. SouthEast Asia, here I come! 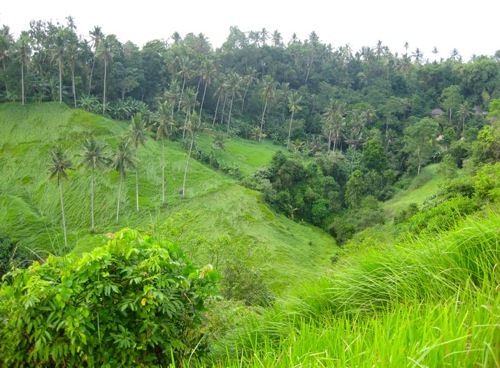 Today we set out on the Campuan Ridge walk, listed in Lonely Planet. The first section of the walk was uphill in the sun through elephant grass fields. We saw workers cutting down the grass and enjoyed some stunning views. 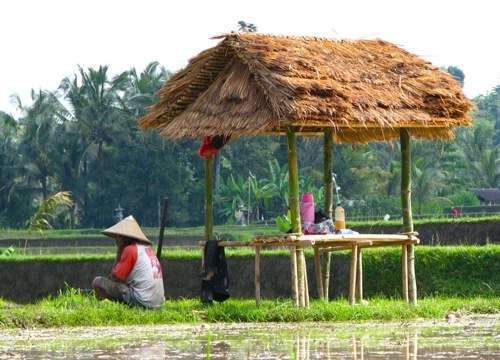 The next section of the walk was through rice paddies where we also saw workers. 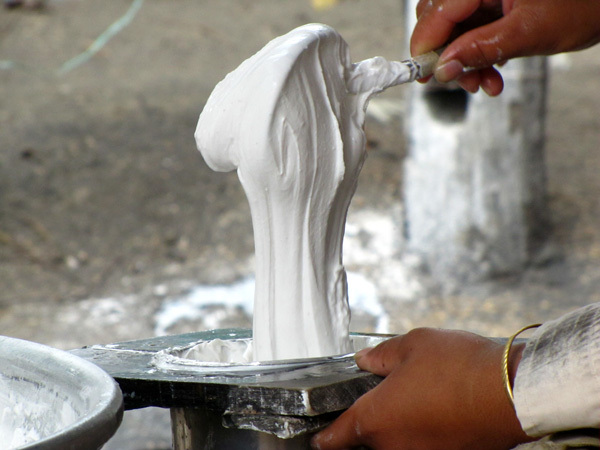 We met a painter named Wayan Rana in Sebali Village and stopped to chat with him for a while. His paintings were much cheaper than we expected – first price 50,000 for a small framed one. 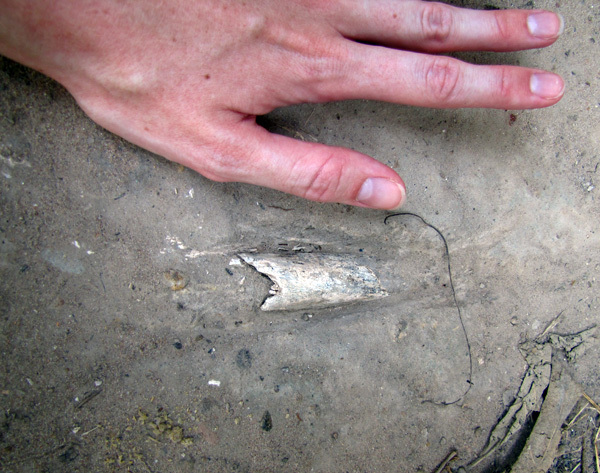 A local guy on a motorbike stopped and tried to sell us some carved bone buttons. We politely refuse and he went on his way, hassle-free. 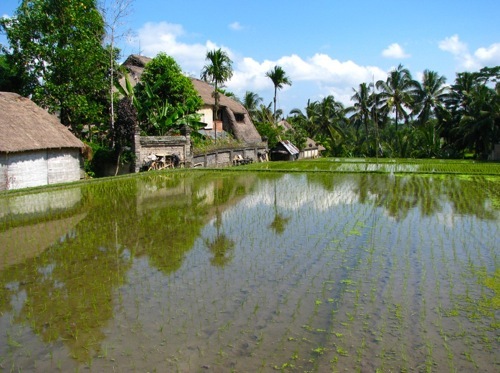 Then we walk on road back to Ubud and saw some residential life. On the way home we stopped at the big Bintang supermarket and got our first beers of the trip for 11,300. The cashier tried to shortchange me but I corrected her. Ryan resisted buying a 5 gallon bucket of strawberry ice cream for 22,500. 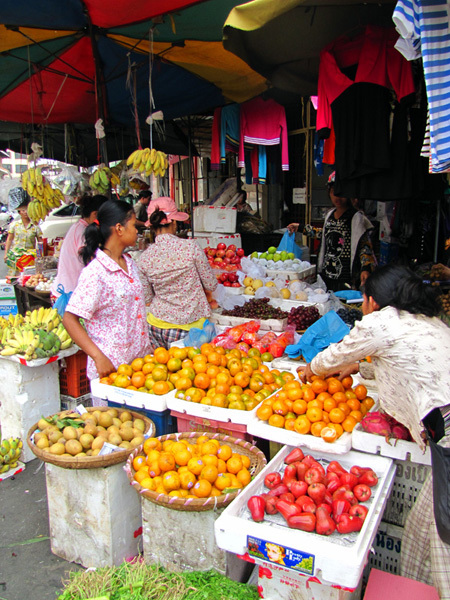 We went to a super cheap street in middle of Ubud – Jl Goutama, and ate at place called Biah-Biah where I got Sayar Urab for 3,000 and steamed rice for 4,000. It was so good and filled me up. We were lazy for the rest of the day and just used internet and Ryan ate dinner at Pundi-Pundi again. Today we took a tour around the central / eastern area of Bali with a company called Jalan-Jalan for 150,000 each from 9am-4pm. We had a driver and car which we shared with one other american guy who was unfortunately an annoying complainer. The first stop was Goa Gajah (elephant cave temple) which was alright, kinda lame, not bad as a stop on a larger tour but I wouldn’t make it a destination. There were lots of school kids there, we took pictures with them throwing gang signs, it was a riot. Next we went to Tampak Siring (the Holy Spring Temple) which was prettier and more interesting. There were lots of school kids there again and a group of boys followed us around asking me for kisses! The temple has a hot spring that worshipers bath in. You can see the spring and it looks cool – black sand bubbling up in the water. On the way to the next stop we went to a local coffee roaster / spice farmer’s place called Sai Land where we sampled some of THE BEST coffee I have ever had. Our favorite was the chocolate and coffee mix but we also tried ginger tea and pure coffee. While there we talked for a while with the owner about the harvesting and roasting process of the regular coffee and the civit cat poop coffee, as well as more personal topics like the upcoming naming ceremony for his almost-3-month-old child! I bought a box of ginger tea from their shop for 35,000 because I thought it was so delicious and I’m sure it will be glad I have it the next time I have a cold. After the holy spring we went to Penelokan where we stopped for a lovely view of Mt. 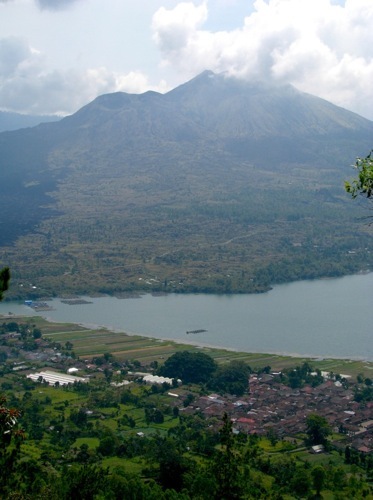 Batur and Lake Batur. 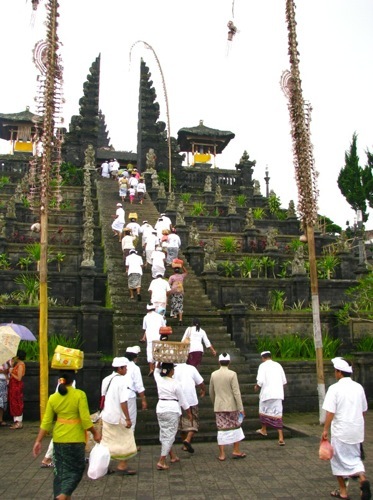 Next stop, Besakih (mother temple), the biggest and most important temple in Bali, located on the slope of Mt. Agung. It was pouring rain the whole time and I was car sick from the windy drive up, but it was beautiful so I enjoyed it. Because this temple is so important only worshippers are allowed inside but tourists can go on the outside stairs and peek in the doorways. There are a fair amount of ‘guides’ trying to scam people around the temple, telling you that you need their services when you don’t, or telling you they can get you in the temple when they can’t (if you do get in you risk being slapped with a huge fine). It’s no big deal, just say ‘no thank you’ to everyone and keep walking. 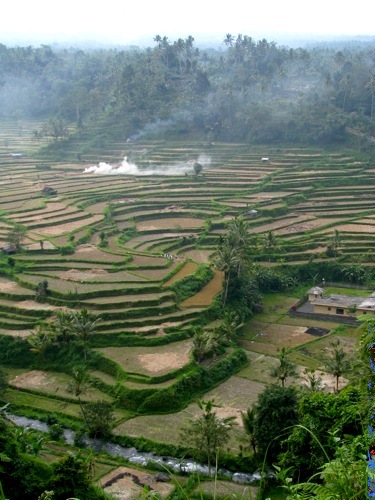 After the mother temple we were taken to a restaurant at Bukit Jambul for an amazing view of the rice terraces – and an amazingly expensive buffet lunch (I skipped the food and Ryan ordered something less expensive al la cart). 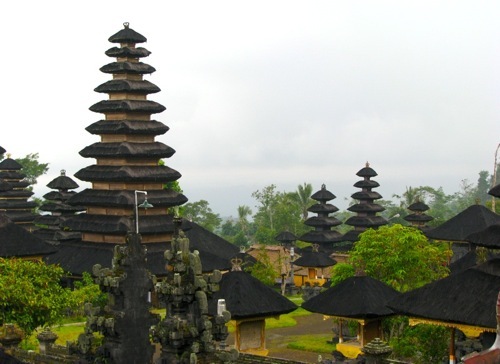 Our last stop was Klungkung, aka Semarapura, which used to be the center of an important kingdom in Bali. We didn’t see many other westerners here so we were getting some funny looks, but we did see more police and military than we have seen anywhere else. 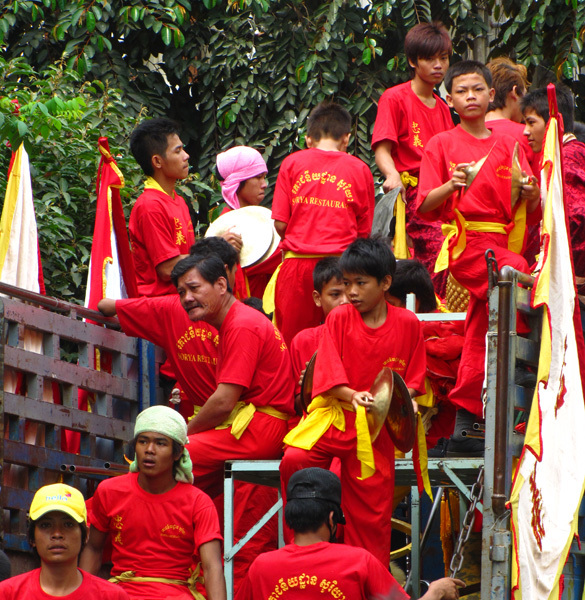 Here we opted to skip the temple and instead sat on some stairs at the Puputan Monument and watched school kids learning drill-down type exercises and an informal soccer game. We headed home pretty worn out. For dinner we wandered to Pizza Bagus which had fast wifi, a mellow atmosphere, and cheap not so great pizza, but we hung out and split a big Pizza Ricotta Spinaci with chicken added to Ryan’s half for 45,000 and two small Bintangs for 23,000. For breakfast at Artini 3 today I had an egg Jaffle which I originally assumed was just waffle spelled wrong, but it’s actually egg or banana between two pieces of toast. It came with fruit and was pretty yummy. We got a ride to Ganesha Bookstore but didn’t buy anything because it was much pricier than we expected. We walked around and found another bookstore and bought a used copy of Stephen King’s The Dead Zone for 35,000. We needed a book to read because tomorrow we are leaving for a very sleepy town called Amed on Bali’s East coast where we hear there is great snorkeling and diving and… peace and quiet! We bought a t-shirt each at the market for 35,000 total, and then I bought a beautiful dress in a shop for 180,000 which is spendy for Bali but this dress rocks and would cost a ton at home. It looks fantastic on me so I figured what the hell. 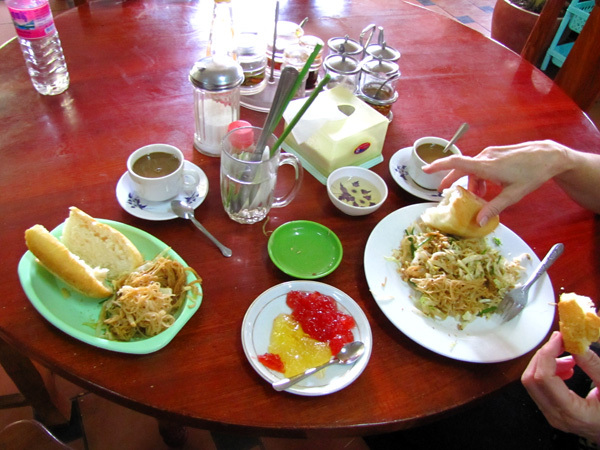 We ate lunch on our favorite cheap street again, this time at a place called Dewa Warung. I got Gado-Gado (mixed veggies with temphe and peanut sauce) for 8,000, Temphe Satay for 10,000 and a coke for 4,000 which turned out to be waaay more food than I needed but I ate most of it because it was delish. 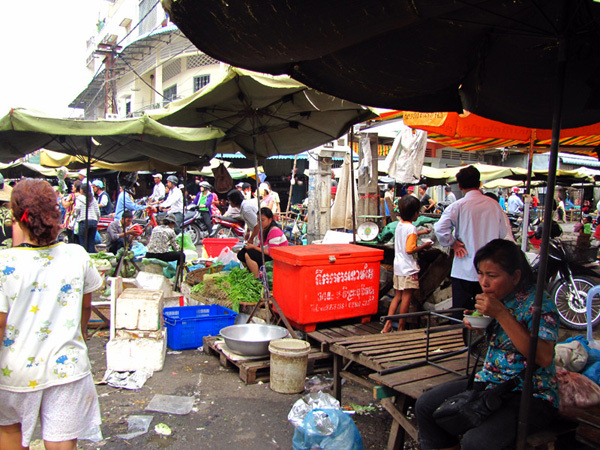 The place had a nice expat backpacker vibe to it and the food was great and dirt cheap. The evening was spent lounging in the pool, doing laundry by hand in our bathtub, and hanging out at Pundi-Pundi drinking coffee for a couple hours while we researched hotels in Amed for tomorrow. We booked the same driver from Jalan-Jalan that we had for the tour yesterday for 250,000 total for the drive. 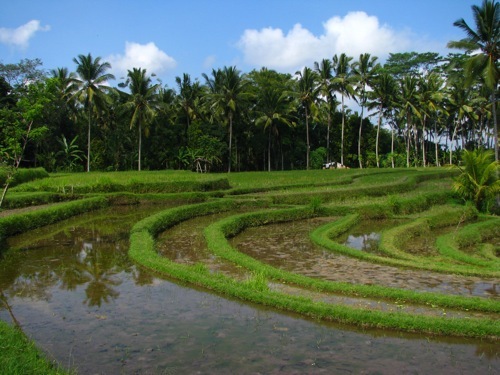 I have enjoyed Ubud a lot and plan to come back at the end of our trip. Now on to Amed!